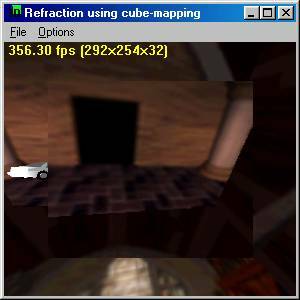 Back when the Geforce 1 first came out (around May, 2000) I wrote a demo on how to use cube-maps to fake refractions. There is a paper is available in word document or PDF file format. Refraction is a phenomenon that simulates the bending of light rays through semi-transparent objects. 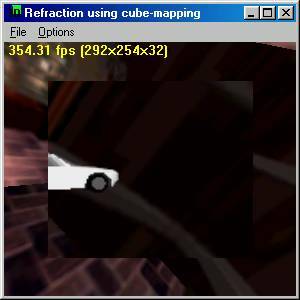 Refraction can make a 3d graphics scene look much more realistic. Real world objects can both reflect and refract light waves to distort images seen through them. There are several properties defined with refraction, Snell's law and the critical angle. Snell's law states that for a light ray going from a less dense medium to a higher dense medium, the light ray will bend in one direction and going from a higher density medium to a lower density medium, it will bend in the other direction. These properties are known as the refraction index and it is a ratio of the speed of light through one medium divided by the speed of light through the other medium. Snell's law states that a light is traveling low index to a high index (e.g. 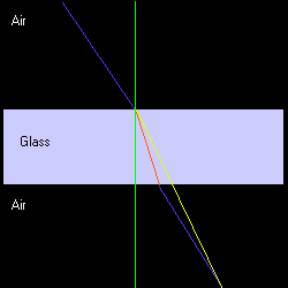 air is a low index and glass is a high index), the light ray will be bent toward the normal. On the other hand if light is traveling from a high index to a low index (e.g. glass to air), the light will bend away from the normal. Here is a diagram of Snell's law. The purple line represents a light ray coming hitting a glass object and you can see that according to Snell's law that the light would bend towards the normal in this case (the red line). n1 * sin(a) = n2 * sin(b) where n1 and n2 are the index of refraction for each medium. If you reverse the sense of the light direction, you can see that if the light were the red line and the light were traveling from the glass to air, it would bend away from the normal of the surface. Snell's law simply states that given an incident ray at an angle relative to the normal of a surface, that ray will change angle based on the refraction index, which is simply a ratio to reduce/increase the angle by after the ray passes from one medium to another. One other point is the fact that most rays enter a medium and leave a medium. For example a ray enters a sheet of glass and then exits the other side of that glass. In this diagram, the top purple line is the incident ray entering the glass, the red line is the ray refracted in the glass and the bottom purple line is the ray coming out of the glass. As can be seen from the above diagram the light ray actually is parallel to the incoming light ray, but is just moved slightly towards the normal. On the other hand if the light ray strikes an object that is in water, then transmits to glass and out to air, then that object contributes to the bending of the light rays. The lines above are all the same as in the previous diagram, except for the yellow line. This line represents the refraction index that is actually used since we are just interested in the end point of the ray. 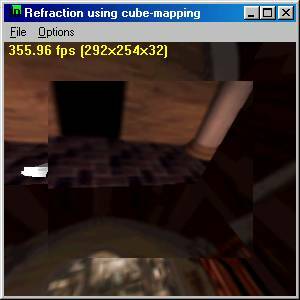 Notice that above the calculation of 1.0f/gRefractIndex should be adjusted for minification/magnification that happens when a texture is being used that does not map to a 1-to-1 correspondence with the object being texture mapped. 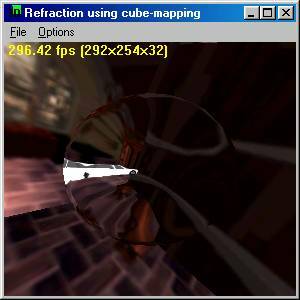 Several papers including Paul Diefenbach's Thesis and early work by Paul Heckbert and Pat Hanahran, suggest using the planes that are refracting the image by use of a projection matrix that changes the angle of view. One problem that Paul Diefenbach notes is that using these techniques may not be possible on some hardware because moving the projection matrix, precludes the use of the Z-Buffer. 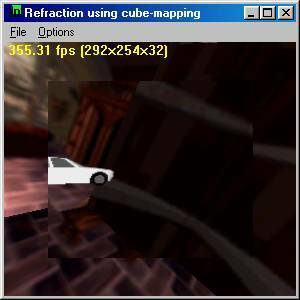 This technique we have described does not suffer from this limitation as it uses cube-maps to render the scene first. The technique does not modify the projection matrix, so the Z-Buffer can be used with this technique. 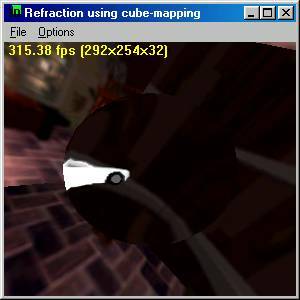 It also might be possible to use the projection matrix along with cube maps to automatically calculate out the values to be used in the cube map. I've looked into this a little, but I didn't see an obvious way to accomplish this. Real world objects also reflect the environment. There is also a critical angle refraction that says when the angles falls between a certain point, the refraction turns into reflection. Another enhancement would be Fresnel effects. All of these effects can be achieved. For the reflection portion, you can alpha blend between the refraction effect and the reflection effect. With the current scheme there isn't an easy way to simulate placing a pencil in a glass of water. This technique also does not allow internal reflections. This effect is using an approximation to refraction. You can achieve real time frame rates using this technique and the end result is visually very good. Throughout this document you will noticed that I did this from the perspective of ray tracing, but you can also view this as ray casting from the eye point.